After the funeral, the mortician handed me a small velvet pouch that contained my mother’s jewelry: her favorite poinsettia earrings, an pearl necklace, and two rings. The first ring was a wedding ring my father gave her after she lost the original while working on the potato harvester. 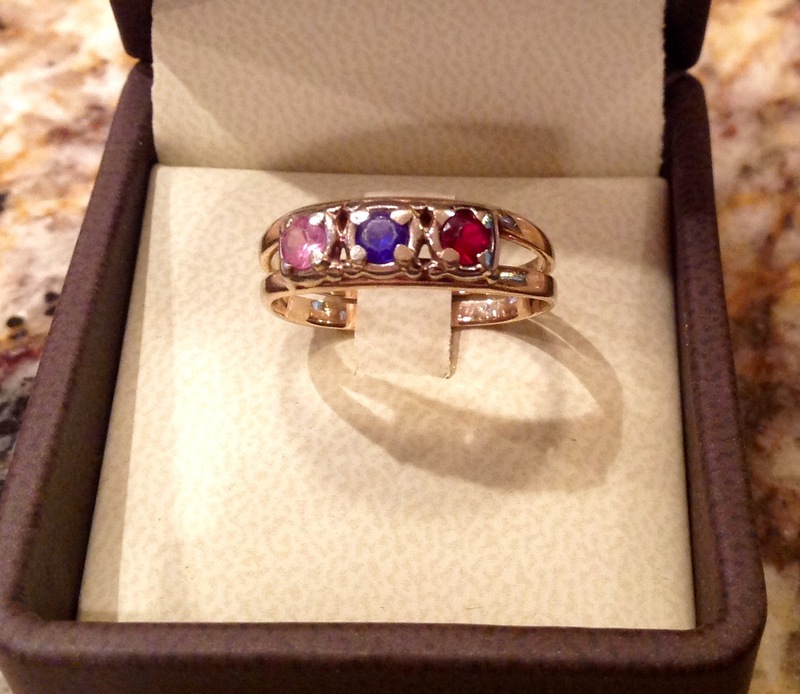 The second ring was a Mother’s Ring she wore for 50 years. She often fingered it with tears in her eyes. My brothers and I gave her the ring decades ago when we young, all lived at home, and still spoke to each other. Our mutual estrangement as adults caused my mother immense pain during the last 15 years of her life. I still have trouble breathing when I remember the lawsuits after my father died, the loud fights, and the sight of my mother crying on the witness stand in court. The judge ruled in her favor, but the damage was done. Our family was shattered beyond repair. I haven’t seen or spoken to my older brother in 18 years. He’s never met my husband or my grandchildren. He never visited his mother after losing the lawsuit, and he didn’t attend her funeral. January, the first birthstone in the Mother’s Ring, is a cold month. The velvet pouch sat on the buffet table in my kitchen for two months and remained there when 24 people came over for Christmas Eve dinner. No one moved it; not even the children. The bag held the last personal belongings of our mother, grandmother, and great-grandmother, and it seems almost irreverent to examine the only tangible things of value that remained after 87 years of life. My husband and I finally opened the velvet bag and placed the rings in a container of jewelry cleaner. We left the necklace and earrings inside, tied the pouch, and placed it in the donation box. I hope someone will be pleased to wear the items. The two rings have been professionally cleaned and are stored in jewelry boxes. I’m saving her wedding ring for my daughter and her daughter. As for the Mother’s Ring, I hope to meet a woman who had babies in January, September, and October, and I’ll give it to her. This ring deserves and needs to be celebrated.